Can y'all believe that Thanksgiving is tomorrow?! I can't believe how fast November has gone. Christmas will be here before we know it! I thought I would put together one last post for Thanksgiving outfit inspiration for y'all before it's time to stuff our faces with turkey! Don't forget to sign up for my newsletter here to have all the best Black Friday and Cyber Monday deals sent straight to your inbox! You don't want to miss out on all the best sales! Such a cute fur vest! Such a cute outfit idea! I am all about the fur vest too! You look gorgeous! 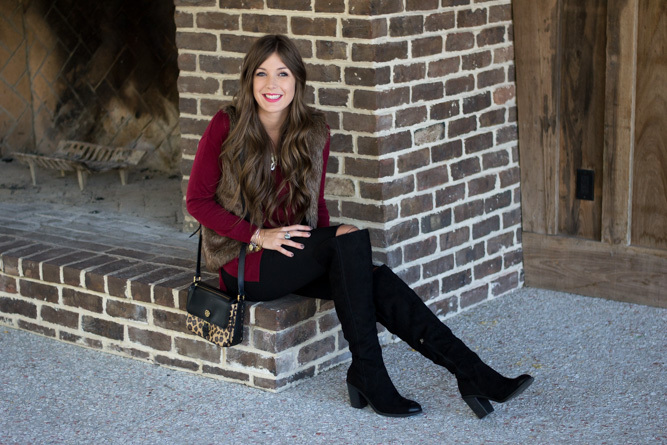 This outfit is Fall perfection!! I'm loving that vest!! Adding the simple vest and boots puts this outfit over the top without being to fancy. Perfect. Such a cute outfit! Love that vest & pop of leopard! Oh my goodness..... can I be your shopping partner??? Love your style! 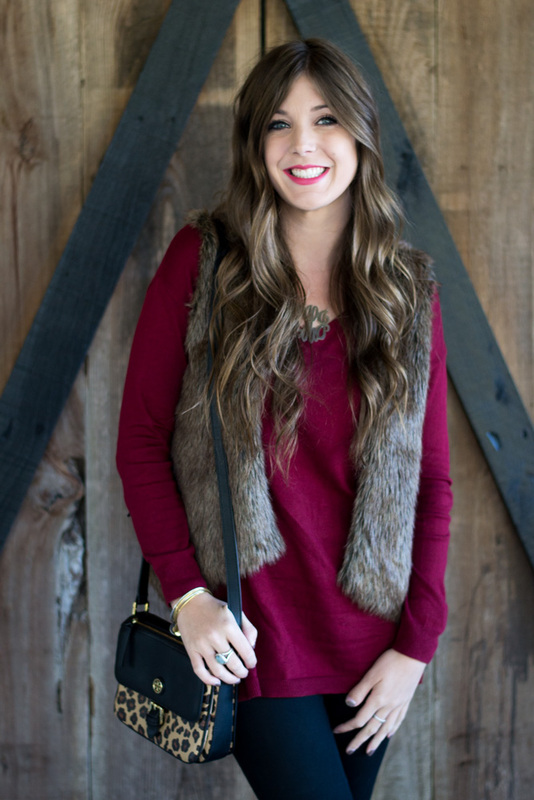 what a cute little fur vest and i love the color of the top! I honestly think fur elevates an outfit to holiday status. You can wear it anytime, but it shows you took that extra trouble to look great for your gathering. I've had a fur vest since the 90's (dating myself) and I still love it. Who knew you could get over the knee boots at Target!! Good way to try them without a huge financial commitment. Lovely post! super cute outfit! happy thanksgiving! A perfectly cozy and pretty look for today. Happy Thanksgiving! Cute outfit!!!! I think a fur vest is perfect for Thanksgiving!!! Casual and cute! such a cute last minute outfit, love the color of the top! Hey gf. My exact vest is old, so I linked a similar one. Not sure about the sizing. Sorry! I am LOVING this outfit! I hope you had an amazing Thanksgiving! Love this whole look! 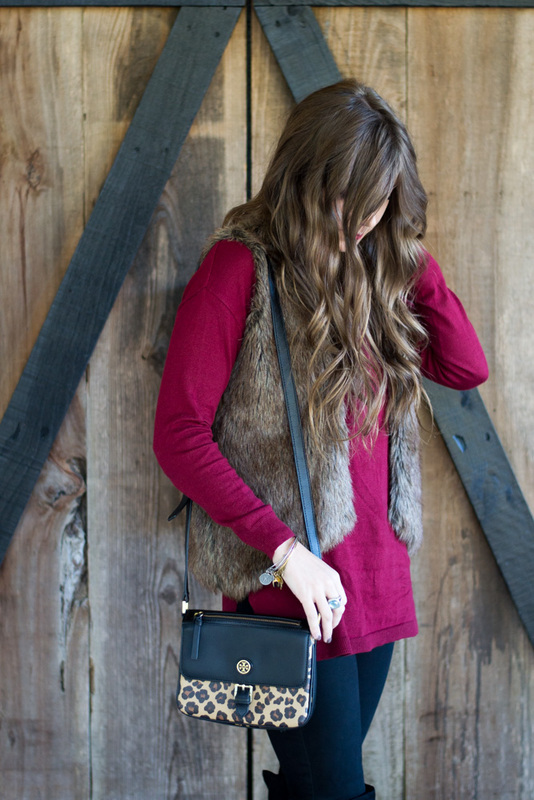 The burgundy top looks great with the faux fur vest!